This weekend we had a taste of spring. The sun was out and patios in the city were open. For a city that has heavy winters, the past few day shave felt like a gift. 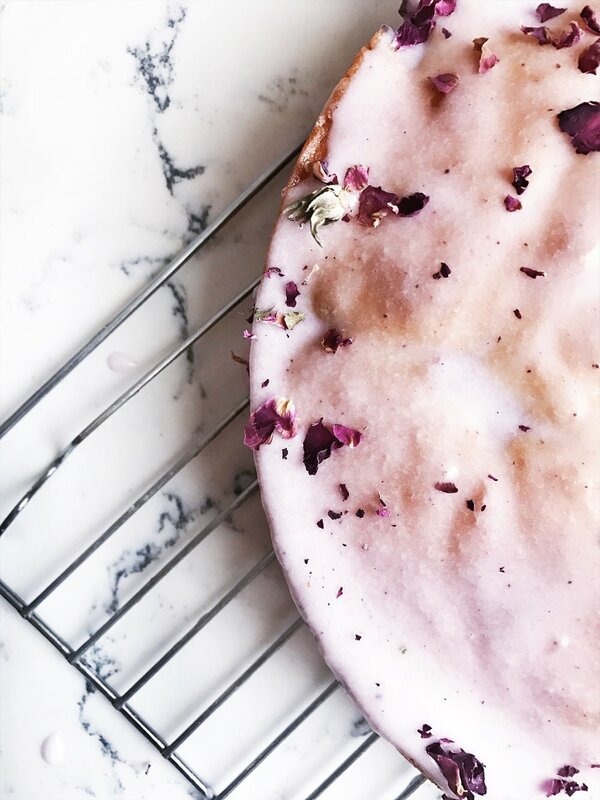 As soon as there’s a taste of even the slightest warm weather, there’s always one thing on my mind, baking. Especially baking with fruit. Trips to the farmers market always end up bringing home cases of berries, peaches and cherries to make galettes, pies, clafoutis or one of my favourite cakes. I first tried yogurt cake while attending the pastry program at Le Cordon Bleu. Our teacher would bake 2 or 3 loaves and pass them around at the end of our day. After 6 to 7 hours on our feet baking croissants, opera cakes and macarons, the simpleness of this yogurt cake was something we treasured. Warm from the oven, its delicious smell all over the kitchen. To this day, this cake brings memories of how much it meant to have a dream come true. To attend my dream school and immerse myself in the world of pastry and bread. When you live and breathe pastry, the creative side, and the very methodical aspect too, never leaves your soul. Baking becomes a way to express feelings, and on days that I am overwhelmed with deadlines or how crazy busy life can be, I find I turn to baking for comfort. 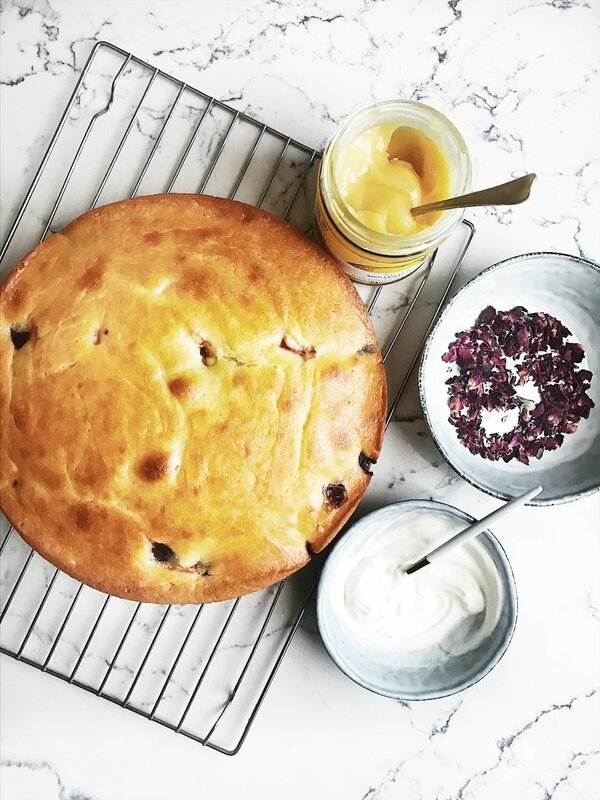 This cherry and yogurt cake was inspired by the kindness of Cedric, our patissier who passed onto his students his love for butter, flour, sugar and eggs. The cake’s batter is smooth and tangy. Yogurt gives it a zing, while the addition of vanilla or almond extract balances it out. For this recipe I’ve chosen to add cherries, but you can add berries, apples, pears or pineapple instead. I like serving it with heaping tablespoons of lemon curd and crème fraîche. Preheat the oven to 350 degrees F. Grease an 8 1/2 by 4 1/4 by 2 1/2-inch loaf pan or a round cake pan. Line the bottom with parchment paper. Grease and flour the pan. Sift together the flour, baking powder, and salt into 1 bowl. Add a tablespoon of flour to the cherries. In another bowl, whisk together the yogurt, 1 cup sugar, the eggs, and almond extract. Whisk the dry ingredients into the wet ingredients and with a rubber spatula, fold the vegetable oil into the batter, making sure it’s all incorporated. Add the cherries, without over mixing the batter. Pour the batter into the prepared pan and bake for about 45 minutes. Test to see if it’s done, by inserting a knife in the centre of the cake and comes out clean. You can also bake this cake in smaller pans if you want mini versions of it. Just lower the cooking time to 25/ 30 minutes. It keeps well for up to 2 days or you can freeze it. Bake it for your next brunch or keep it in mind for an upcoming summertime picnic!